Fuller, E. 1995. 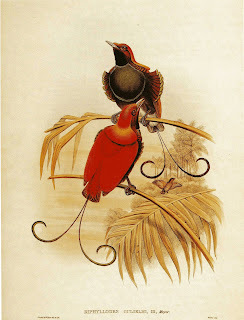 The Lost Birds of Paradise. Swan-Hill Press. 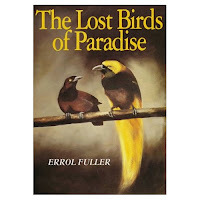 The 19 "lost" birds of paradise that Errol Fuller describes in this book are forms that are mostly only known from very few specimens, often with very little supporting information. What makes them "lost", however, is that despite all but one of them being described as new species, all of them were later reinterpreted as hybrids between better-known species. Fuller's motivating question is whether these specimens are indeed hybrids, or represent valid species that might occupy unknown restricted ranges somewhere in the depths of New Guinea, or may perhaps have slipped into extinction without ever getting the recognition they deserved. Most of the specimens reached Europe through the plume trade. Specimens of birds of paradise were purchased from native collecters and then shipped back to the West for use in the fashion industry (the first country to ban the import of birds of paradise for plumes, according to Fuller, was the US in 1913, a development that probably had less to do with the developing conservation movement than with the increasing unfashionability of wearing plumes*). As a result, the available collection data on most specimens is decidedly hazy - few bear more specific information than "Dutch New Guinea" (the western part of New Guinea that is now controlled by Indonesia). Even if a more specific locality is recorded, it is often unreliable - specimens could be passed through a number of different native tribes before eventually reaching the European traders. Throughout the book, we get introduced to many of the figures involved in the collection and study of these mystery birds. *To add further complexity, a major factor in the decline of popularity of plumes was actually the rise in popularity of the motor-car - ornate plumed hats being decidedly impractical for wearing in open-topped cars. 'Paradisaea mirabilis', a possible hybrid of Paradisaea minor (lesser bird of paradise) and Seleucidis melanoleuca (twelve-wired bird of paradise). 1902 lithograph by Bruno Geisler. Throughout Fuller's book, we get introduced to many of the personages involved in the collection and study of the specimens (including the spectacularly named Captain Neptune Blood*). A significant number passed through the collection of Lord Walter Rothschild, a somewhat eccentric enthusiast who amassed one of the world's largest private natural history collections (Darren Naish wrote a piece two years ago on Rothschild and his unusual enthusiasm for cassowaries), though many of Rothschild's bird of paradise specimens were included in the collection he was blackmailed into selling to the American Museum of Natural History**. The "hybrid" specimens were largely identified as such in 1930 by Erwin Stresemann. Fuller accuses Stresemann of overzealousness in embracing his hybrid theory of origin for "species" known only from one or two specimens, essentially assuming from the start that all such species must be hybrids of known species and identifying "parents" from the available options no matter how poorly supported. **Probably not, I hasten to add, by the American Museum of Natural History. 'Diphyllodes gulielmitertii', almost certainly a hybrid between Diphyllodes magnificus and Cicinnurus regius. Unlike most of the other forms described by Fuller, this hybrid occurs fairly commonly, with more than two dozen known specimens. 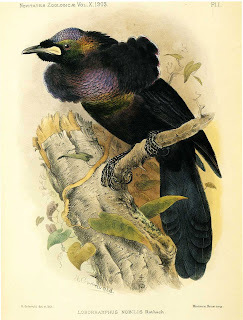 Lithograph by J. Gould and W. Hart. Unfortunately, many of Fuller's reinterpretations of the supposed hybrids end up falling a little flat. Fuller accepts a hybrid origin for some forms, refutes it for others, but in many cases it is debatable whether his interpretations are any better than Stresemann's. Because all Fuller has to go on is examination of specimens, most of his arguments for valid species status amount to little more than replying to Stresemann's statement that "Species A has features intermediate between those of B and C, and is therefore a hybrid between the two" with "No it doesn't, so it isn't". In two cases where Fuller does accept hybrid status, 'Loborhamphus ptilorhis' and 'Lamprothorax wilhelminae', the reasons for linking them to their supposed parents seem decidedly unconvincing (which, of course, does not eliminate the possibility that they could still be hybrids between other species), while 'Cicinnurus lyogyrus', which Fuller hesitatingly accepts as a hybrid of the king bird of paradise (Cicinnurus regius) and the magnificent bird of paradise (Diphyllodes magnificus) seems more likely to be simply an aberrant variant of Cicinnurus regius. In contrast, 'Janthothorax bensbachi', which Fuller suggests is a valid species, seems more likely to be a hybrid. Probably DNA analysis of the specimens would be the only way to convincingly decide the question one way or another - Fuller suggests this would be difficult because the close relationships of the parent species would make results unconvincing, but resolution of molecular analyses has decidedly improved since 1995. The main barrier would be that DNA extraction from museum specimens, especially ones that have been in storage since the 1800s (and were probably not exactly fresh when they first reached the museum) is a difficult process, with little guarantee of success. Loborhamphus nobilis, regarded by Stresemann (1930) as a hybrid between Paradigalla carunculata and Lophorina superba, but by Fuller as a probable valid species. Unlike the other bird of paradise species mentioned in this post, the less sexually dimorphic Paradigalla species are not polygamous breeders, and form permanent pair bonds. They therefore strike me as less likely to produce hybrids. 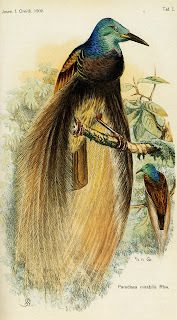 The Lost Birds of Paradise is certainly a lavishly illustrated book, reproducing paintings by Gould and other spectacular bird illustrators (some of which I've taken the liberty of re-reproducing), as well as numerous photos and drawings. The distribution and subjects of these illustrations are often a little erratic, however - what's with the naked man in the bath on page 76? - and this same erraticism extends to the text. I can't escape the impression that most of the essays on the various birds were composed separately, with little cross-checking between chapters when the book was compilated. The story of Stresemann's 'overzealous' revisions is repeated a number of times in different chapters, for instance, while many chapters include rather tangential passages on matters related to birds of paradise in general, but not necessarily directly relevant to the specific form the chapter is devoted to (not surprisingly, this is particularly noticeable in some forms known only from single specimens for which otherwise Fuller probably just wouldn't have had that much to say). Probably this eclecticism is most marked in the chapter on 'Paradisaea mixta', in which we are treated to a lengthy quotation from the autobiography of Errol Flynn (complete with full-page photograph) and a description of his experiences trying to start a career collecting birds of paradise in New Guinea some years before he became an actor. And what does this have specifically to do with 'Paradisaea mixta'? As it happens, absolutely nothing. Still, The Lost Birds of Paradise is easily readable, and at least highlights that the identity of many of the "hybrid" birds of paradise is not as firm as might be thought. A commentor on one discussion thread makes the comment that Fuller obviously really wants there to be overlooked species of birds of paradise, which may lead him to be a bit more hasty in his judgements than he probably should be. Nevertheless, New Guinea, especially the western half, is a surprisingly unexplored place, and as the recent discovery/rediscovery of unknown or near-unknown mammal species there shows, it would be wise to not rule anything out just yet.